Whatever the origins though, this is clearly a time-tested recipe that in my experience has given me incredible results every time. The hardest thing about cooking moist and flavorful fish is keeping it from drying out. Making a salt-mixture that you press over the entire surface of the fish, hardens into a kiln-like casing in the oven locks moisture in. This trapped moisture gently steams the fish to perfect doneness. Start with a whole fish making sure not to remove the scales or the skin. 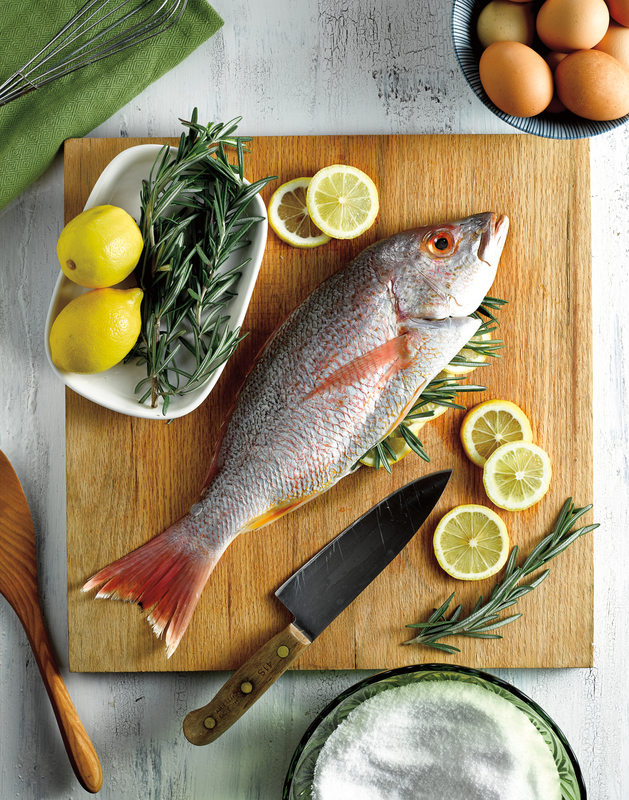 This method works with virtually any kind of fish (trout is another favorite in addition to the snapper I use in this recipe). I find that a fish with scales is more moist than a scaled fish, but it can be a little harder to clean once it is cooked, so you can have your fish monger remove the scales if you want. Then, all you have to do is pack the body cavity with citrus and aromatics and you’re ready to add the salt casing, no additional seasoning required. Experiment with different citrus and herbs for variations. Summary: An ancient dish that is easy to prepare and will wow even the most cynical of your foodie friends. Pre-heat your oven to 400ºF. Line a sheet pan with parchment paper and set aside. Whisk the egg whites until they form stiff peaks (an electric mixer makes this very easy, but you can do it by hand if you want a workout). Fold the entire box of salt into the egg whites and gently mix until all of the salt is slightly moist and the egg whites are evenly distributed. Your salt mixture will resemble lightly packable snow. 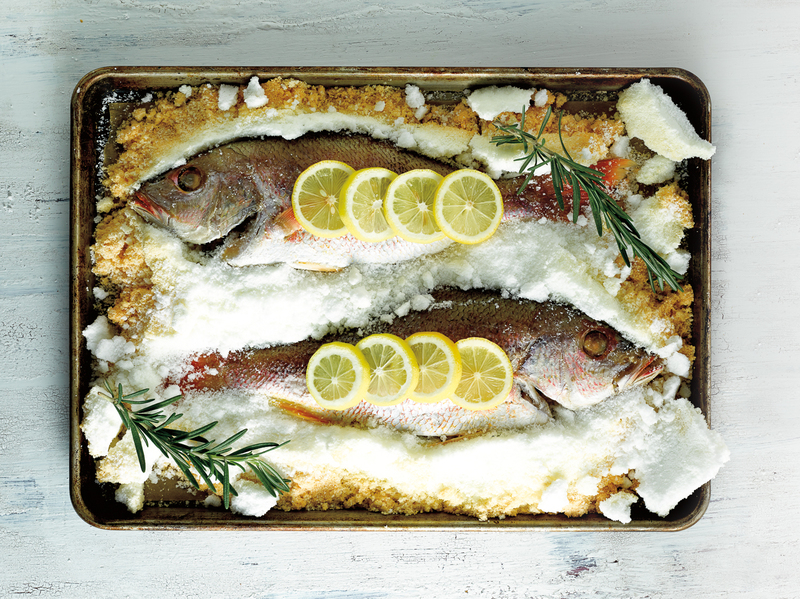 Spread a thin layer of the salt mixture onto the parchment paper on your sheet pan, covering enough space to accommodate both fish laying side by side. Place the fish on top of this layer of salt, nose to tail. 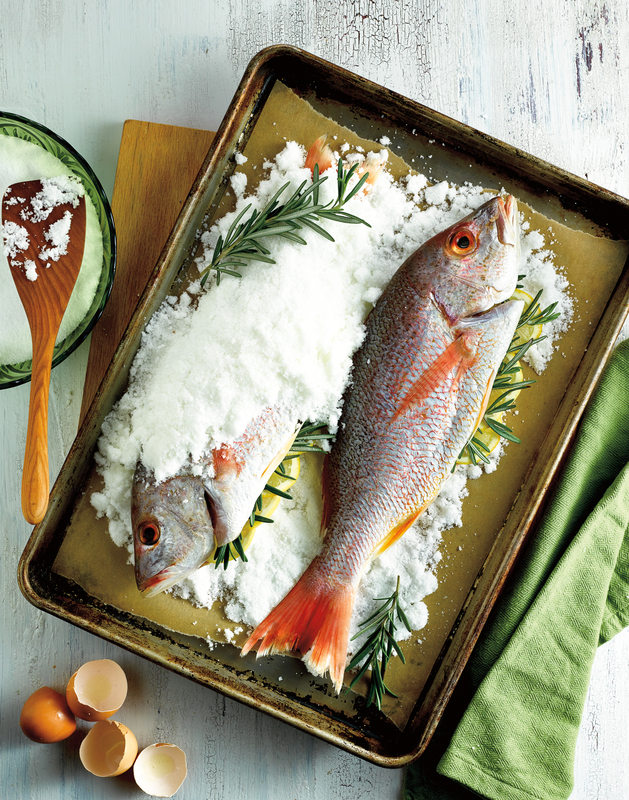 Using your hands, gently pack the remaining salt over the fish, packing it firmly to cover the entire surface of both fish (if you run out of salt and the tails are peeking out, that’s ok). Bake for 25-30 minutes until the internal temperature of the thickest part of the fish reads 135ºF (you can push a thermometer through the salt crust). Remove the fish from the oven and allow to rest for ten minutes. Smack the salt crust gently with a wooden spoon, then carefully pry off the crust. Be gentle so you don’t gouge the delicate fish underneath. You can use a soft brush to remove any excess salt that remains. Carefully lift off the skin, remove the bones, and serve!